Apple has released an official version of iOS 10.3 for the iPhone, iPad, and iPod touch which includes bug fixes and security improvements. What’s new in iOS 10.3? 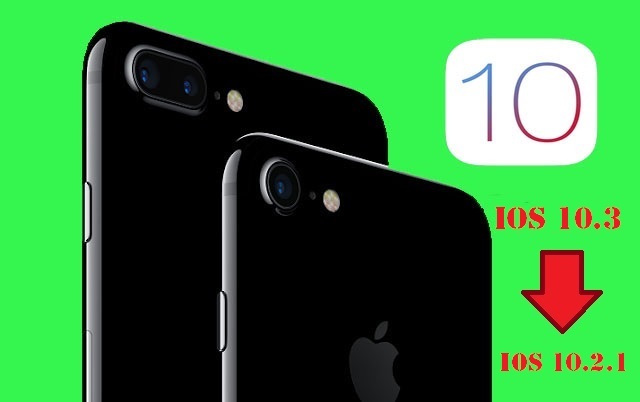 With the release of its new version of iOS 10.3, many of you have already downloaded the latest iOS version of 10.3 on your iPhone, iPad and iPod touch to get some new features and improvements but if you are a jailbroken user and waiting for iOS 10.2.1 Jailbreak in future then we recommend you to downgrade immediately iOS 10.3 to iOS 10.2.1 firmware. So for jailbreakers, do not upgrade to the latest version of iOS 10.3, it’s better to stay on lower iOS like iOS 10.2.1, 10.2(for iPhone 7-7 Plus) if you want to jailbreak in the near future. And if you are already on iOS 10.1, iOS 10.1.1, 10.2. Here’s how to jailbreak iOS 10.1.1 with Yalu and Cydia Impactor. How to Downgrade iPhone from iOS 10.3 to iOS 10.2.1Since jailbreak for iOS 10.3 is not yet available, you can downgrade your iPhone-iPad from iOS 10.3 to iOS 10.2.1 as earliest for future jailbreak because Apple might stops signing the iOS 10.2.1 in the coming days that is you cannot downgrade back iOS 10.3 to iOS 10.2.1 if Apple stops signing in that iOS version. No worries if you had accidentally upgraded to iOS 10.3 via iTunes through developer account or OTA update. Since Apple is still signing the iOS 10.2.1 firmware, downgrading to iOS 10.2.1 from iOS 10.3 is now possible or if you feel iOS 10.2.1 is better than iOS 10.3 or if you have also faced a number of issues on iOS 10.3 or want to stay in iOS 10.2.1 for future jailbreak then you can easily downgrade iOS 10.3 to iOS 10.2.1 on your iPhone-iPad. Here is how you can downgrade back to iOS 10.2.1 quickly from iOS 10.3 on your iPhone-iPad. First of all, you need to download the iOS 10.2.1 firmware file for your device from our Download page. You need to upgrade or download iTunes to the latest version on your Mac or PC. Now Turn off Find my iPhone & disable passcode lock via the Settings app. (Settings > iCloud > Find my iPhone). Hold the Alt/Option key on the Mac or Shift Key in Windows on your keyboard. Now Select the iOS 10.2.1 ipsw file you had downloaded earlier. iTunes will inform that it will restore your iOS device to iOS 10.2.1 and Click Restore. After restored, your device will reboot to the welcome screen and will now install iOS 10.2.1 on your device. That’s it. Your device should now be successfully downgraded to iOS 10.2.1 from iOS 10.3. Stick with us for more news, rumors, tips and tricks and many more regarding iOS devices and Stay updated and don’t forget to follows us on Facebook, Twitter, Google+, or RSS.